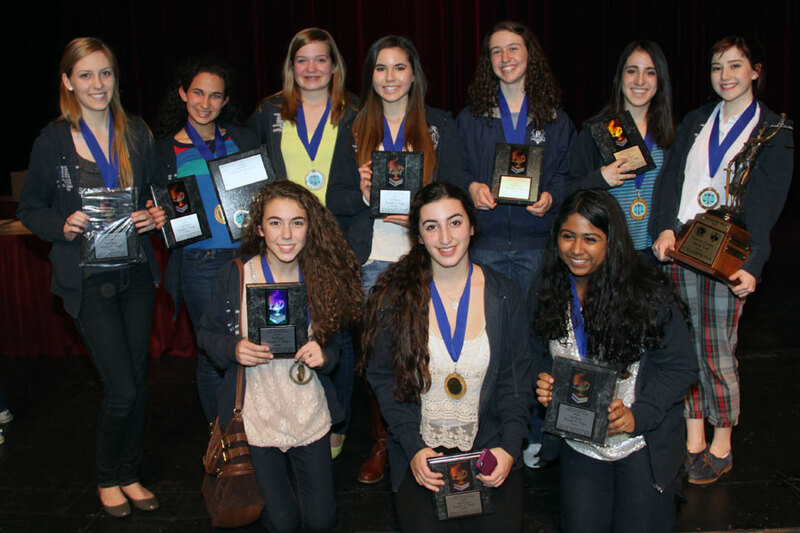 After four nights of intense trials, the La Reina Regents were named champions of the 2013 Ventura County Mock Trial competition. This marks the 18th county title for the Regents since 1990. Shown in this photo are team members (front row) Olivia Aulicino '14, Camilah Hamideh '14, and Nisha Srinivasa '14; (back row) Elizabeth Hribal '13, Ryanne Bamieh '14, Callan Buechsenschuetz '16, Devin Montgomery '15, Edie Sussman '15, Ally Zlaket '15 and Lena Melillo '13. Coaches include Liz Harlacher, faculty adviser, and attorney coaches Ron Bamieh, Roxanne Torabian-Bashardoust '96, Gretchen Buechsenschuetz, Jean Wentz and Daniello Desmeth. Ryanne Bamieh '14 also earned a first place award as Pretrial Attorney for the Prosecution, while Lena Melillo '13 was voted Most Valuable Player for La Reina by other teams. The Regents now advance--as defending champions--to the California State Competition in late March.